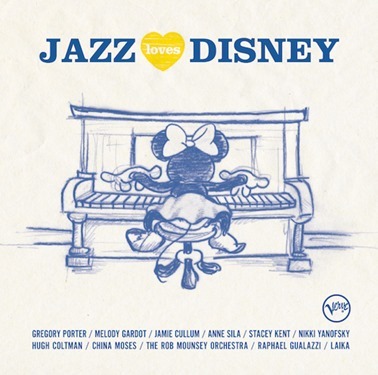 Jazz Loves Disney–And So Do We! We recently decided that we’ll be visiting Disney World for two days in December! One of the first things we do after we schedule a Disney trip, besides talking non-stop about everything that we want to do when we’re there, is start listening to Disney music. I have been a fan of Disney music for as long as I can remember, playing my favorite record albums and singing with my parents! Now, I love that my kids listen to and love the same music I loved as a child, plus all of the amazing new music that we all enjoy today. My kids of course loved the music that they were most familiar with – Let It Go from Frozen and You’ve Got A Friend In Me from Toy Story! I enjoyed those tracks as well, plus the ones that I loved since I was a child, such as When You Wish Upon A Star. The mood of the music really brings back childhood memories and it is amazing to be able to pass it forward to the next generation as well. The album is available for pre-order (releasing on November 18) on iTunes and Amazon, so check it out!